Born in Algeciras in 1972. From childhood he wanted to be an architect, so he studied at the Technical School of Architecture in Seville, graduating in the COA of Cadiz in 1999. Before finishing his degree he began to collaborate with some architecture studios in Seville and Cádiz, later going on to practice as an independent professional heading up his own studio. Throughout his professional life, he has also worked three times at the service of the Public Administration: Municipal Public Housing Company of Cadiz (PROCASA), with the Department of Assistance to Municipalities of Medina Sidonia of the Provincial Council of Cádiz, and the Department of Urban Discipline of the Town Council of Cadiz. "I have always understood architecture as a service that the client requests from us to meet their needs, and not as a mere stylistic exercise in which to display our plastic skills and reap recognition among our colleagues. That is why, at Gumersindo Fernández Arquitectos, we put function before that of shape, which is not incompatible with making buildings that are beautiful and still in line with the budget. With this philosophy we obtained the Termoarcilla award in recognition of one of our works, but no recognition is greater than that of the satisfied cleint. " Gumersindo-. 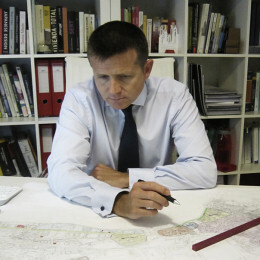 Gumersindo Fernández Arquitectos SLP began his career in Cádiz in 1999, carrying out the traditional activities of an architectural studio: projects, site management and urban planning works. After studying over the years how to improve certain real estate development processes, Gumersindo Fernández's team of architects, successfully introduced the integral management of real estate developments, integrated management of construction, management of cooperatives, the commercialisation of real estate, and finally the administration and maintenance of residential buildings, once these have been delivered. On the other hand, the exhaustive knowledge of local regulations, the administrations involved, the socio-economic situation of the city, and of the other agents that collaborate or compete in the sector, give this studio a privileged position to find the most appropriate solutions for its clients. The specialisation within the activity in the area of the city of Cadiz and its surroundings, provide an added value to its services. The experience and an open attitude to any change in the sector, make it possible for the Gumersindo Fernández Arquitectos studio to offer its clients consultancy and advisory services, adapted to each moment and need. This website shows a compilation of the most outstanding and photogenic works that have been undertaken, with other works being able to be consulted in the curriculum that is set out below. -Residential building. CL San Salvador, 8. Cádiz. -Residential building. CL Almirante Vierna, 13. Cádiz. -Residential building. CL Hospital de Mujeres, 42. Cádiz. CL Cristóbal Colón, 21; CL Obispo Urquinaona, 8. Cádiz. -Tourist apartments. CL Torres, 41. Cádiz. -Tourist apartments. CL Villalobos, 2. Cádiz. -Tourist apartments. CL Corralón de los Carros, 59. Cádiz. -Residential building. Paseo Ramón de Carranza, 24. Cádiz. -Residential building. Avda. Portugal, 9. Cádiz. -Residential building. CL Cervantes 5-7. Cádiz. -Residential building. CL Vea Murguía, 38. Cádiz. -Adaptation of an office for housing. CL Corneta Soto Guerrero, 5. Cádiz. -Residential building. CL Barrocal, 9-11. Cádiz. -Adaptation of Torre mirador into housing. CL Torres, 14 dup. Cádiz. -Residential building. CL Campo del Sur, 22. Cádiz. -Refurbishment of the CAISS premises. Pto. Santa María. Cádiz. -Refurbishment and interior design of a lawyer's office Avda. Andalucía, 43. -Renovation of the Tax Office façade. Córdoba. -Adaptation of premises. CL Santa Inés, 3. Cádiz. -Residential building. CL Huerta del Obispo, 10. Cádiz. -Single family house in Avda. De los Barcos, 38. Conil. -Tourist apartments. CL Puerto Chico, 4. Cádiz. -Interior refurbishment of a dwelling. CL Sacramento 31. Cádiz. -Interior refurbishment of a dwelling. CL Claudio Coello. Madrid. distribution of furniture. CL Cristobal Colón, 2. Cádiz. -Refurbishment of the Old People's Home ADEMA. Cádiz. -Premises for the storage of Biouniversal oil. Cádiz. -Consolidation of structure. Casa Patio. Seville. -Students residence. CL Antonio López. Cádiz. -Refurbishment of 2 houses. CL Vea Murguía, 40. Cádiz. -Site management 9 houses. CL Portería. Cádiz. -Transformation from premises to dwellings. CL Marqués de la Ensenada. -Transformation from premises to a dwelling. CL Santa María. Cádiz. -Refurbishment Colegio Las Esclavas. Jerez – Cádiz. -Residential building. CL San Rafael, 49-51. Cádiz. -Refurbishment of a dwelling Avda. América. Urbanización Roche. Conil. -Adaptation of Baluarte de la Candelaria for a cocktail bar. Cádiz. -Extension of the Restaurant Cumbre Mayores. Cádiz. -Floor structure for Versatile discotheque. CL Girasol . Vistahermosa - Cádiz. -Refurbishment of a dwelling. CL Parlamento, 21. Cádiz. -English Centre. Puerto Santa María. – Cádiz. -Single family house. Lagos del Serrano – Seville. -Single family house. Urbanización Roche. Conil. – Cádiz. -Refurbishment of a building. CL Torres, 51. Cádiz. -Refurbishment and interior design Colegio Graduados Sociales. Cádiz. -The La Mirandilla Sports Centre. Cádiz. -Refurbishment. CL Palacios, 37. El Puerto Santa María. – Cádiz. -Refurbishment and interior design Centro Cadis. Seville. -Refurbishment and interior design GF Arquitectos SLP. Cádiz. -Rural Hotel. Carmona – Seville. -Adaptation of Orthopaedics. San Fernando – Cádiz. -Golf course. Vejer – Cádiz. -Old People's Home. Medina Sidonia – Cádiz. -Single family house. Sotogrande – Cádiz. -Social Security Agency. Algeciras – Cádiz. -Rural apartments. Barbate - Cádiz. -36 houses and 48 Lofts. Zahara de los Atunes – Cádiz. -Refurbishment of a residential building. CL San Pedro, 18. Cádiz. -Refurbishment of an apartment building. CL Torres, 51. Cádiz. -Complete refurbishment CL Sagasta, 1. Cádiz. -Refurbishment Cl Mª Arteaga, 25. Cádiz. -15 dwelling residential building. CL Cruz, 11. Cádiz. -Single family houses. Montecastillo. Jerez – Cádiz. -2 dwelling residential building. CL Palma 8-10. Cádiz. -Refurbishment of a building. CL Rosa, 4. Cádiz. -Las Lagunetas rural hotel. Benalup – Cádiz. -8 dwelling residential building in Benito Pérez Galdos. Cádiz. -Adaptation of lawyer's office. Cádiz. -59 dwelling residential building in Playa del Carmen. Barbate - Cádiz. -Single family house. CL Hnos. Lagarde. San Fernando – Cádiz. -Hotel Winthuissen. Puerto Santa María. – Cádiz. -75 Single family terraced house. Medina Sidonia – Cádiz. -8 dwelling residential building. CL Sagasta, 105. Cádiz. -5 dwelling residential building. CL Sacramento 7. Cádiz. -Single family house. Los Almendros – Sotogrande. Cádiz. -Extension of the Arte Serrano restaurant. Cádiz. -24 terraced houses. Medina Sidonia – Cádiz. -Refurbishment of building. CL Pasquín, 19-21. Cádiz. -114 multi-family dwellings. Medina Sidonia – Cádiz. -51 dwelling residential building. Barrio La Viña. Cádiz. -8 dwelling residential building. CL Salazar. Cádiz. -Single family house. CL Calderón de la Barca, 1. Cádiz. -40 dwelling building in Las Canteras. Benalup – Cádiz. -Rural hotel in the centre of Abejaruco. -38 homes and urbanisation. Caños de Meca – Barbate. Cádiz. -Parque de los molinos. Vejer – Cádiz. -Refurbishment in Residencia Tiempo Libre. Cádiz. -5 dwelling residential building. CL Portería de Capuchinos, 19. Cádiz. -Refurbishment of 2 houses. CL Sopranis, 9. Cádiz. -6 dwelling residential building. CL San Isidro, 9. Cádiz. -Hospitality and catering school. Cádiz. -The Trocadero carpentry warehouse. Cádiz. -Municipal file. Paterna Rivera – Cádiz.